My first completed project from my Finishing List! This one was the easiest to finish. It’s good to start with an easy victory. I merely had to hand sew the hole closed on the inside lining of the bag. Still, sometimes those little details stop us from finishing a project for way too long. 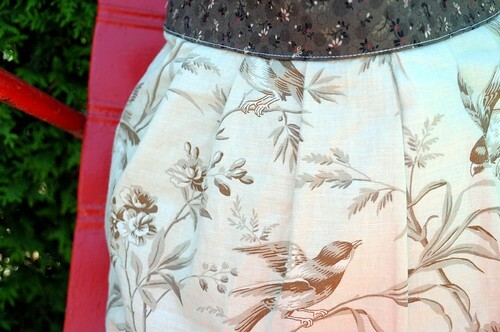 I made this Birdie Sling for my mom for Christmas (2009). The fabrics I chose for her ended up feeling pretty summery – French General Linen/Cotton blend with birds and a coral pink batik for the lining, so I’ve finished it just in time to get some good use this season. I tried something a little different this time, rather than using interfacing or muslin on the inside, I used an organic cotton canvas that we have in the shop. 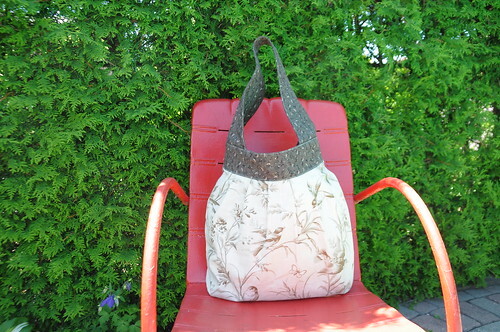 I’ve used this previously on other bags I’ve made and like the results. I just baste the canvas to my pieces before sewing them together. It also means I don’t need as much. When using interfacing, every single piece gets a layer of interfacing. With the canvas, I just did a single layer of canvas for each part. For example, I basted the canvas to one of the layers of the handle and not the other. One layer of the canvas between the two gives enough stability. 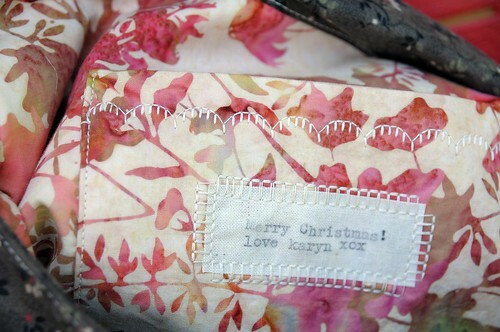 I made a special label for the inside by typing onto muslin and did some machine embroidery to embellish the pockets. Once you’ve made a couple Birdie Slings, you don’t even need to look at the instructions and it’s a pretty satisfying project to complete. Although I’m enjoying my Day in the Park Backpack Tote, there’s something really great about the roomy Birdie Sling. As soon as I find the perfect fabric, I’ll be making myself another, for sure. Posting my Finishing List has gotten me really motivated. I almost finished machine quilting my Buzz Saw quilt last night. More finished projects coming soon! Lovely! And the label gives me a good idea for a gift I’m finishing… is that ironed on or? I love the pink batik! Nice work on finishing the bag! ariana – i type directly onto the muslin with my typewriter… using iron on transfer paper is another option, but i prefer this look. angelune – easiest project first. i’ve just put the binding on my buzz saw, so that should be done by the end of the weekend. i need to get some more pretty batiks like that. i really love that persimmon pink colour right now… similar to the one from the neptune collection. Really pretty bag. I was out of interfacing and was thinking of using canvas instead on one of my projects. Very helpful post.